Abuse your student status – If you're still in college, take advantage of the credit cards that literally get thrown at your feet and keep one after you graduate. You're entitled to a card for two years, so grabbing one before the pomp and circumstance will be a huge boon once you become a marked man (i.e., recent grad). Beg your bank – If you don't have a credit card left over from your college years, the easiest way to get one is to inquire with your bank. All the major banks offer a huge number of credit cards, and hopefully you've been a loyal customer. Pick a card – Think about which card best fits your requirements. A low interest card is good for those who simply want to make the minimum payment every month (though this is a terrible idea). For people who make a lot of purchases, the reward/cash back card is the gift that keeps on giving back every time you buy something using the card. Mileage cards – These are worth the annual fee for frequent travelers. Every time you charge a purchase, you get miles and you can redeem them for airline tickets. Don't go overboard – The fewer credit cards you apply for the better. Applying for numerous credit cards in a short period of time can adversely affect your credit score. binges. For those of us that no longer have the luxury of a student e-mail address, getting a card is going takes a little more leg work. Here's how to do it. Why is it so hard to get credit cards now that you’re out of school? Credit card companies use two main factors to decide whether or not to issue someone a card: income and credit history. Although you had neither of these while in college, obtaining a credit card was as easy as stopping by one of the ubiquitous application tables, filling in your Social, and calling it a day. Heck, you even got a free T-shirt or Subway sandwich out of it. Credit card companies jumped at the chance to issue you a card because they knew your parents—who likely had respectable incomes and established credit histories—would be there to bail you out if you got in over your head. Now that you’re out of school, you still don’t have much of a credit history, your starting salary is fairly meager, and your parents are less willing to serve as a safety net. Add it all up, and you’re just not a good credit risk. Daunting as it may seem, getting a new credit card is a necessity in this day and age, and it's very doable. Just choose a strategy, and follow through with it. Strategy 1 – Get a credit card while still in college, and hold on to it for dear life. For those of you still in college, the easiest solution to this problem is to get a card before graduation, making the matter moot. Since credit cards take a minimum of two years to expire, you’re grandfathered in for at least 24 months, and assuming you make all your payments, you will have little problem renewing the card. Although there’s no such thing as a new-grad-specific credit card, there are dozens of student-specific cards out there. Student credit cards are a breeze to get, and are no different than non-student cards. One of my favorites, the Citi Dividend Platinum Select Card for College Students (now that’s a mouthful), has all the same features of the Citi Dividend Platinum Card, and doesn’t even say “College Student” anywhere on the front. In addition to a low interest rate, the CDPSCCS rewards you with a cash back rebate of 1% on all your purchases (and 2% on groceries and gas). Strategy 2 – Find the perfect card and hope your application is accepted. For those of you already out of college, it’s just a matter of knowing what you want, and going to the right place. The easiest course of action is to inquire with your bank, and see what they have to offer. You’ve been loyal customers for years, and they’ll likely reward you with some form of plastic cash. Bank of America, Washington Mutual, Wells Fargo, and Citi all offer a laughable number of credit cards. When deciding on a card, there are three general types to look for: low interest, rewards, cash back, and airline miles. In many ways, the interest rate should be irrelevant because you should always pay your bill in full every month, But for those of you content to make the minimum payment every month, the most important thing you can look for in a card is a low interest rate. 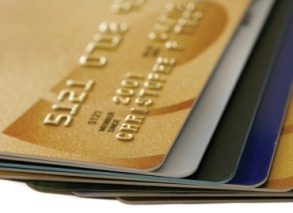 When it comes to credit cards, 7% is about the best you can do. A common practice is to offer 0% interest for the first year. Be advised that once the 12-month honeymoon ends, a double-digit rate hike can be expected. Bank of America offers a great card with 0% interest for 12 months and even gives you cash back. Find out what paying the minimum really costs you. Cash back credit cards have been a cornerstone of the Pekema family since the dawn of time. Passed down from generation to generation, I’m now the proud owner of an American Express Blue Cash card. It pays me back 5% for my purchases at grocery stores, gas stations, and drug stores, and 1.5% on all others (after minimums are met). Needless to say, the $50 checks I receive every few months are a day-maker. Amazon.com offers a card similar in concept (Amazon.com gift cards instead of cash) that also gets you $30 off a purchase from their site. Think of it as the new Macy’s card. Another highly rated card for people who like to stay at nice hotels is the American Express Starwoods card. Some consultants from Bain ran some numbers and claim it's the best option for people who travel a lot. Then again, they get to rack up crazy points paying for flights and then getting reimbursed by the company. With all of these cards, if you don't spend very much the rewards will be pretty negligible. Miles cards pretty much all work the same way: charge purchases, get “miles,” and redeem miles for airline flights. It’s no big secret. The Chase Travel Plus Visa is one example of the dozens of miles card options out there. If you’re loyal to a specific airline, finding a card associated with it makes your flights and credit card purchases doubly rewarding. Use CardRatings.com to compare over 500 cards that are conveniently sorted into categories like "Low Ongoing Rate," Cards for No/Poor Credit," "Cash Back Rewards," and "Gas Rebate Cards." Also, ask friends, family, and coworkers about good cards that have worked for them. Once you get one, hold onto it and don't cancel even if it just sits in your wallet and never gets swiped. Also, request a credit line increase after six months. Sure, the initial credit line might be a little skimpy, but after a few months of on-time payments, you should be able to get it bumped up. Want a ridiculous credit card? Check out these bad boys. Credit cards should never be used as a way to get long-term loans—the interest rates that credit card companies offer simply aren't competitive. Always pay your bill in full, and read more about building and maintaining credit so you don't fall into any traps. Also, applying for numerous credit cards in a short period of time can adversely affect your credit score, so take it slow and steady. Finally, beware of the allure of store credit cards, which can actually hurt your credit score. They are the easiest cards to get, and thus the most dangerous. If you legitimately buy your entire wardrobe at J. Crew, then the savings will be worth getting the card. But be careful about signing up for cards you'll forget about. Just graduated college, still have my ID card, as well as a college email address. Only problem is, I moved far from my college for a job opportunity. Is there a way I can still find those nice college student credit cards online?